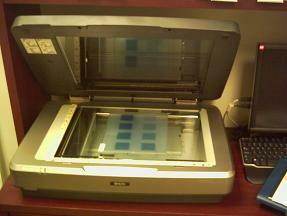 It is recommended to heat the scanner with about three scanned before scanning our movie. The orientation (portrait or landscape) Radiochromic scanning of film is very important to always keep the same, and it is recommended to do so in landscape mode always. spatial resolution is recommended 72 dpi. Higher resolutions introduce greater noise by reducing the pixel size. A very important detail for scanning on a desktop scanner is the focus of the film on the surface scanning, this is to avoid the lack of uniformity may be near the edges. The Radiochromic film has a time of two hours until it stabilizes after irradiation. The Epson scanner XL12000 (DinA3) desktop is the scanner that gives the best answer for clinical dosimetry film Radiochromic. This scanner has software that allows desabilitación all kinds of color corrections (Microtek scanners apparently have some sort of correction to the image can not disable, so they are not recommended for clinical dosimetry, also they have more noise than Epson scanners). Images can be saved in a file without compression, as tif, and in 48 bits (never less) to work with the red channel doses for clinical use. Tips for scanning Radiochromic pelíclua.